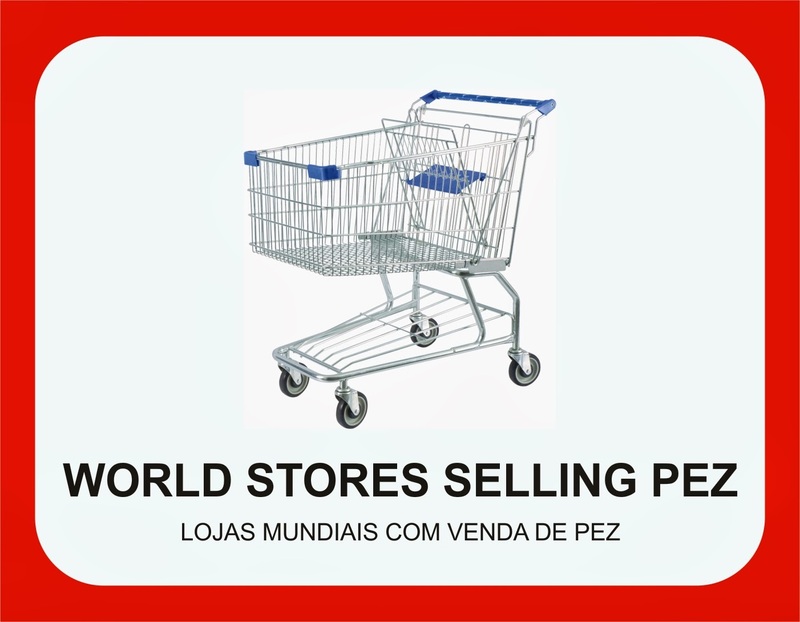 Uma das dúvidas entre coleccionadores, prende-se com o facto de quando viajam para um país diferente saberem onde poderão encontrar produtos PEZ, seja em pequenas lojas ou em grandes superfícies comerciais. Aqui ficam disponibilizados alguns países e respectivos nomes de lojas. Esta lista é feita com informação de coleccionadores e será sempre que possível actualizada. AUSTRALIA - Coles Supermarket, Big W, Priceline, Candy Time, Target. AUSTRIA - Billa, Merkur, Penny, Spar, Interspar, Hofer, Zielpunkt, Adeg, Unimarkt, Shokothek, Toys ‘R’ Us, Muller, Vienna Airport Duty-Free. CANADA - Walmart, Toys ‘R’ Us, Dollarama, Metro, Zehrs, Shoppers Drugmart, Target, Party City, Rexall, Bargin Shop, Micheal’s, The Real Canadian Superstore, Giant Tiger, Sears, Sweet Delights Victoria, Bulk Barn. CROATIA - Konzum, Kaufland, SPAR, Plodine, Interspar, Billa, Getro, Muller, Metro. DENMARK - Bilka, Føtex, Døgn Netto, Kvickly, SuperBrugsen, Dagli Brugsen, Lokal Brugsen, SuperBest, Spar (Super, Euro, Kwick Spar), Kiwi Minipris, Toys 'R' Us. ENGLAND - Appleton Sweets, Primark, Toys ‘R’ Us, Hamley's Toy Store, Cybercandy, Kingdom of Sweets, Iceland, Mr Simms Olde Sweet Shoppe, B&M, Oh So Sweet, The Range, Poundland / 99p store (sometimes). ESPAÑA - Belros, Carrefour, Mercadona, Eroski (shopping center), Disney store, SPAR, Consum, Eroski Hipermarket, Eroski Center, Eroski city, Caprabo, Alcampo, Ahorramás, Blackout (Barcelona), (little candy stores), (some gas stations). ESTONIA - Prisma, Rimi, Selver, Konsum, Comarkert, Tallinna Kaubamaja, Tartu Kaubamaja, Maksimarket, Solaris, Grossi Toidukaubad, Kaupmees. FINLAND - Kesko, Prisma, S-Market, Rautakirja. FRANCE - Auchan, Carrefour, Intermarché, Leclerc, Cora, Toys ‘R’ Us (some), Super U.
GERMANY - BabyOne, Bela, Butlers, Famila, COOP, Dursty Beverage market, Edeka, Globus, Hamberger, Dohle/HIT, Kaiser’s Tengelmann, Metro, Kaufland, KIK, Lekkerland, Müller, Netto, Pako, Real, Rewe, TEDI, Tegut, TOOM Market, Toys 'R' Us, Woolworth. GREECE - Carrefour, Veropoulos, Massoutis. INDONESIA - Seven Eleven, Target, Walmart, Alfamart, Hypermart, Superindo, Carrefour, Toys Kingdom (some). ISRAEL - Shufersal, Mega, Ye'ynot Bitan, Tiv-Ta'am, Yohananof, Cinema-City malls, Super Markado, Airport Duty-Free, Super-Pharm, Rami-Levi, Bluesquare, Coop, Hezi Hinam, Kim’at Hinam, Super Dosh, Plitzer, Stop Market, Eden Teva, Freshmarket, Lahav store, Red Pirate, Big-Toys. Happening, Menta. JAPAN - Aeon, Ito Yokado, Daie, Seiyu, Uny, Maruetu, Izumiya, Summit, Rozen, Ralse, Toko store, Max Value Hokkaido, Coop Sapporo, York Benimaru, Tohoku Max Value, Coop Miyagi, Beisia, Peacok, Inageya, York mart, Ecos, Yaoko, Valor, Yamanaka, Heiwado, Kansai super, Izumiya, Mandai, Fuji, Aeon chushikoku, Furesuta,Tenmaya store, Sanribu, Nishitetu store, Joyful sun, Marutaka, Kaldi, Don qui jote, Toys ‘R’ Us, PLAZA, Okasino machioka, Ohsamano okasirand. MEXICO - Liverpool, Sears, Palacio de Hierro, Sanborn's, Sams Club (special editions). NORWAY - Spar / Eurospar, Meny, Ultra/Centra, Joker, ICA, Rimi, Coop, Rema, Bunnpris, Toys 'R' Us. PORTUGAL - Continente / Modelo, Pingo-Doce, Belros, Auchan, Jumbo / Grupo Auchan (Dolce Vita Tejo / Amadora), Jumbo / Grupo Auchan (Alfragide / Carnaxide), E’Leclerc, Intermarche, El Corte Ingles, MiniPreço (DIA), Primark (Centro Comercial Colombo / Lisboa), Gas stations (Tangerina, M24), Glood, Clarel. SOUTH AFRICA - Pick 'n Pay, Checkers, Spar, Shoprite. SWEDEN - ICA, Coop, Bergendahlsgruppen (Eko, City Gross), Axfood (PrisXtra, Willy's, Hemköp), Toys 'R' Us. THAILAND -Tops Supermarket, Lotus, BigC, MaxValue, Gourmet Market, Jiffy. USA - AC Moore, Academy, Albertsons, Bed Bath and Beyond, Big Lots, Bartell Drugs, CVS, Christmas Tree Shop, Dollar General, Dollar Tree, Drug Mart, Fred Meyers, Fuzziwigs, Frys, Food Lion, Giant, Giant Eagle, Hannaford, H-E-B Grocery, It's Sugar, Jungle Jims, Jo-Ann Fabric, Lucky Grocery Store, Meijer, Kroger, Michael's, Navy Exchange, Navy Commissary, Party City, Publix, Powell's Candy Shop, Rite Aid, Russel Stover, Ralph's, Shop Rite, Stop and Shop, Safeway, Sweeties, Stater Brothers, Toys ‘R’ Us, Target, The Ingles Advantage, Von's, Walmart, Walgreens, World Market, Wegmans, Winn Dixie, Weis, (99 cents stores). Will be traveling and want to find PEZ? Click the image! Vai viajar e quer encontrar PEZ? Clique na imagem! For all Fans of PEZ and The PEZCAR Project on FACEBOOK!